This year’s DTL was a high-energy journey into all things teachy, learny, and techy. Format was different this year, leading to more lively offerings that included show and tells, mini workshops, discussions, author book discussions, vendor showcases, poster sessions, alongside the traditional 45-minute information sessions. And with each offering having a different time length, things certainly got interesting for maximizing conference time. The morning keynote was provided by Richard Culatta. Richard has arguably the coolest job title ever: Chief Innovation Officer for the State of Rhode Island. 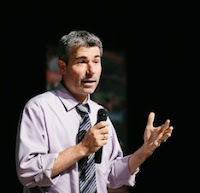 His rapid-fire presentation was titled Technology as a Tool to Reimagine Learning. Among other gems of wisdom was the suggestion for creating user experience (UX) groups to assist in maximizing the user experience. 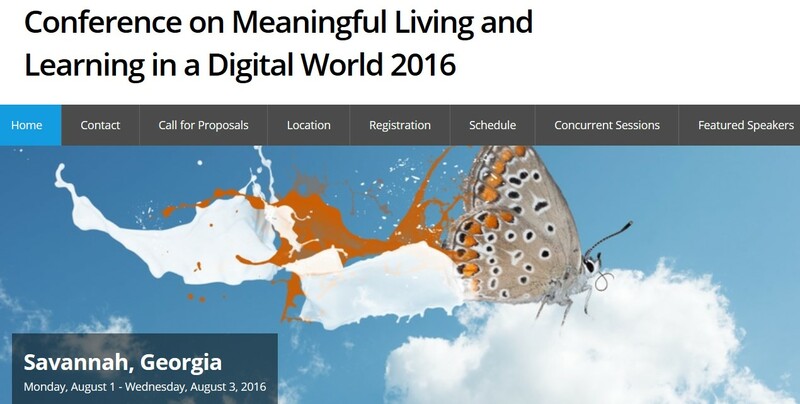 UX groups are much more than focus groups or advisory panels. UX groups assist developers in creating the perfect user interface that takes into consideration both the physical as well as the holistic experience. In his follow up session, Richard suggested never having a big project rollout. Doing so sets the project up for failure as users will expect perfection and be annoyed when things don't work as they should. Rather, conduct small pilots and solicit suggestions for improvement of the product. Then gradually increase the size of the pilot while incorporating any suggested improvements. Later that day I scored a free book! Curt Bonk (U. Indiana) and Thomas Reeves (U. Georgia) co-edited the book MOOCs and Open Education Around the World. At the discussion forum, they handed out free copies to the grateful circle of attendees. The overall message of the discussion was that MOOCs are still a globally popular method for obtaining knowledge, even though they may not be redefining higher ed as was originally predicted. And one of the stalwarts of the educational technology field was honored at the Wednesday luncheon. 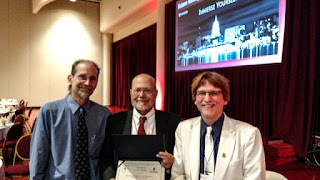 Ray Schroeder, Associate Vice Chancellor for Online Learning and Professor Emeritus of Communication at the University of Illinois-Springfield, was presented with the Mildred B. and Charles A.Wedemeyer Excellence in Distance Education Award. The award represents “distinguished contributions to the scholarship and practice of distance education”. I’ve attended Ray’s pre-conference workshops on technology innovation for several years and have yet to be disappointed. A humble, caring, and tireless champion for the cause of distance education and learning technologies. Congratulations to Ray on this much deserved honor. TodayMeet: a back channel for use in classes. Zeetings: easy to use cloud-based polling site. Remind: reach out to students en masse without sharing personal info. Ringly: ring version of the smart watch. 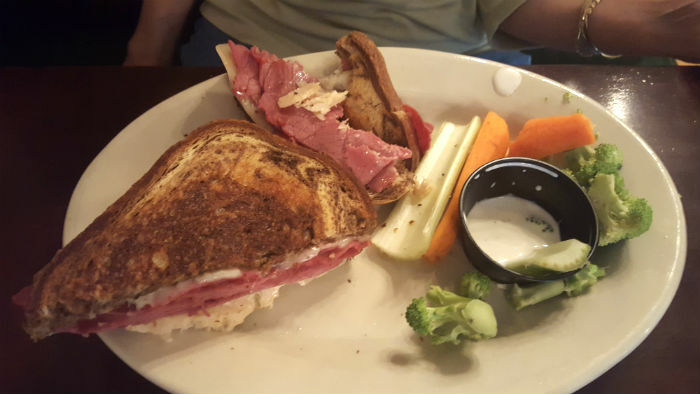 Irish Road Reuben with fresh dipping veggies. And the venue at the Frank Lloyd Weber-designed Monona Terrace in Madison never disappoints. And I stumbled across a new favorite eatery called the Great Dane Pub and Brewing Company on King, just off the Capitol Square. Tasty burgers and brews. Well done once again, UW-Ex! Well once again I will say this conference is great conference for the price and the fact that it is held in Boulder. Jill a co-worker commented that this year the conference didn't seem to focus on specific tools. I have to agree that this year it seemed to take on a more holistic approach to education and learning. I liked this approach. It wasn't that technology was ignored at all, but it was more about how we interact with technology, and how it can be used to enhance our capabilities. One of my biggest takeaways was how I think about technology. I had a tendency to keep technology in a box, and go get what I needed out of the box when I needed it. After hearing Professor Brenda J. Allen (CU Denver) give the Keynote on Optimizing Technology's Promise, I realized that technology is not something in a box. It is something that is all around us, and keeping it in a box really could limit how we use it. I liked how she described technology as anything that isn't part of the human body that helps increase human capability. This isn't a direct quote, but it is the message that I came away with, and I think it really opens the door to a more inclusive view of technology. Prior to this I never considered eye-glasses technology. Don't minimize the person. Say a person who is blind, not a blind person. Collaboration is critical in working with anyone on a project. Listening and managing expectations up-front is critical. Content Experts tend to want to share what they know, and Instructional Designers want to share what the student needs to know. MSU Denver is using Agile and a Market Driven model for instructional design. I am happy to talk more on all or any of the above. Stop by and let's chat. To some degree everyone probably struggles with finding a balance with work, family, life, and perhaps school. The good news is that we can personally take control and formulate solutions to achieving the balance. The bad news is that sometimes the pursuit of balance itself compounds the stress! We really need to be proactive by gathering tools and seeking knowledge and information on how to accomplish balance. Learn to recognize when you are out of balance. (ideally we want this to occur before you get sick or end up in ER) DO NOT ignore the warning signs! Listen to your body. Get real and assess your smart phone addiction. BreakFree is an app that acknowledges your smartphone addiction and helps you break it by recording the amount of time you spend on it. How long can you go without your smartphone? Reflect on this. Research from 2015 shows that on average adults check their cell phone 46X a day. How many times in an hour do you touch your smartphone? o Nomophobia- the fear of being separated from your smart phone! o Reflect on if your smart phone adds to your stress or relieves it. Work email on your personal device- is this a good thing or not so good? Pros/cons; expectations? Do you have personal boundaries for using your device, social media, work email etc? It is important to make a list of boundaries for yourself and then share it with your circle of people in your life. Maybe even make a list of exceptions for certain situations. Identify non-negotiable social norms. Be honest with friends, family, co-workers, on how it makes you feel. Often times people are oblivious to how their behaviors may affect other people. Practice a digital detox every now and then. Establish offline times (for example, the phone is shut off during dinnertime, family time, 2 hours before bed, during the night, etc. Reflect and make a list of what causes stress in your life. What small changes can you make? How might you leverage your smart device to assist? Know your students! If you find that many of your students are working moms or single parents formulate communities. One suggestion was to have a social forum for easy meal planning, perhaps an exchange of tips and ideas. The balancing of work, family and school can be challenging. We talked about tips for family such as (delegating, learn to say no, establish boundaries etc. Create student social communities (perhaps at a program level) such as military family students, first generation students, older adults 50+, single parents, working moms, etc. What causes burnout among faculty? There are several things that may impact this. Give students tools for success; guide them; mentor them; DO NOT feel obligated to take on the responsibility to FIX the problem. Create healthy boundaries for teaching. Communicate this with your students. When there are common questions/issues that arise EVERY term consider getting assistance from your friendly instructional designers at your campus to address solutions. Create FAQs that become reusable each term. · One idea that was generated; enable advisors to play a more active role in assisting students with challenges of school/ life balance. Or within a program/department/ have one or two set mentors ready to assist. 7 Ways to Manage email so it doesn’t manage you! o CamScanner- stop carrying around business cards, receipts etc, take a quick pic and file it in Evernote. Schedule guided meditations at certain times of the day (or when you really need it). Build in mindfulness practices in your courses for your students. Perhaps before an Exam or as the end of a course approaches. Try mindful coloring! Calm your mind, reduce stress and release your inner child. Research backs this but honestly it is no-brainer. Just try it and see how it makes you feel. Stop, Breathe & Think app is a simple tool to guide people of all ages and backgrounds through meditations for mindfulness and compassion. Mindfulness: The Art of Being Human app: 2.99 also available on Android. And of course, there’s YOGA! Try it! Look for a local yoga center and give it a go. There are so many different kinds of varieties of yoga. There’s more to yoga than downward dog. It is a mindful practice that restores your life in more ways than you can imagine. Regis friends and colleagues, you can attend weekly yoga right at our Coors-Life fitness center. And YES there are apps for that too so you can practice a little yoga when you need it for free!